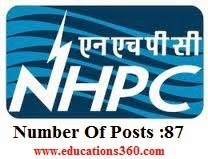 NHPC Recruitment 2014 through GATE 2015 , Number Of Posts :87,last date 01-10-2014. Post Name :Trainee Engineers (Electrical) Through GATE – 2015. Qualification :Candidates should possess full time regular Bachelors Degree in Engineering/ Technology/ B.Sc (Engineering) Degree from recognized Indian University/ Institution approved by AICTE or AMIE (enrolled before 31-05-2013) with minimum 60% marks or equivalent grade. Age Limit :Candidates maximum age should be 30 years as on 01-04-2015. How To Apply :Eligible candidates can apply online for GATE- 2015 through the website http://gate.iitk.ac.in/GATE2015/ from 01-09-2014 to 01-10-2014 and after obtaining GATE- 2015 Registration Number apply Online for NHPC through the website http://www.nhpcindia.com/career.htm from 01-01-2015 to 31-01-2015. Last Date To Apply :01-10-2014.